Ten years ago, Bungie was practically an unknown developer outside of the Mac platform; while several of their games, such as Pathways into Darkness, the Marathon series, and the Myth series helped boost their fortunes, Myth was the closest thing they had to a hit outside of the Mac platform. Oni, their first console release, was less than well received and not very good, and the company’s next big game was going to be some sort of third person action/real time strategy product for Mac and Windows… called Halo. Somewhere along the way, Microsoft stepped in, threw enough money and promises at Bungie to get them to sign on exclusively, and ended up getting the Halo we know as their flagship franchise and killer launch title on the Xbox, and the FPS genre was forever changed as a result. It’s not even a tiny exaggeration to say that Halo: Combat Evolved COMPLETELY changed the genre, and anyone who says otherwise can basically be shut up by pointing at something like Modern Warfare 3 and clearing your throat dismissively, because it’s true. So it makes perfect sense that Microsoft would want to do something special for the tenth anniversary of the game that basically redefined the FPS and almost single-handedly made their games division, and re-releasing the game as a legitimate “high definition”Â re-release isn’t a bad way of doing something special in recognition. It also gives 343 Industries a chance to really show what they can do, at least on a technical front, so we can have an idea of if the franchise is in good hands, and as the game isn’t debuting at the full sixty dollar price point, it’s not a bad deal all around. So let’s see, after ten years, how Halo holds up. Fans of the franchise know the plot of the game all too well, but for those who are coming in new, Halo centers around experimental super soldier Master Chief Petty Officer John-117, AKA Master Chief. Our protagonist is the last remaining Spartan (as far as we know at this point), borne from a project meant to create superior soldiers for the purpose of fighting an alien force known as “The Covenant”Â. When we pick up the story, Master Chief and the crew of the Pillar of Autumn, the ship he and the crew used to escape from the now destroyed human world of Reach, are being attacked by Covenant forces and have a very small possibility of not being smeared across the cosmos. During the battle, the ship’s AI Cortana discovers a circular artificial world, dubbed “Halo”Â, and the crew end up making an emergency escape to the planet to regroup… but as Master Chief and Cortana soon discover, there’s a lot more to Halo than just its looks. Halo: Combat Evolved was where the franchise first began, and the storyline holds up well enough today, as the initial introductions to the different races and characters that populate the universe generally work well even now and the plot is sparse enough that it’s not overpowering while being strong enough that it carries the experience well. Master Chief is a fine protagonist and while Halo doesn’t do a substantial amount to really expand on what’s going on in the game universe and why, it’s a fine entry point for newcomers and holds up well enough, writing-wise, to be enjoyable. Halo: Combat Evolved Anniversary actually has a pretty neat trick up its sleeve, visually, as you can switch between the original visuals and the updated visuals at any time with a press of the Back button, and wow we have come a long way in ten years. Halo was, at the time, very visually impressive, and featured very beautiful landscapes and effects, but the visual update to the game completely blows the original graphics out of the water in every way that matters. The excellent design aesthetics and artistry of the later game models is brought into this game, along with some technically strong backdrops and environments that look fantastic as you wander through them, and the enemy and ally animations are generally very strong. The game isn’t pushing the technical limitations of the console as hard as it could be, but it’s technically solid and visually impressive all the same. Aurally, the game brings the original soundtrack and audio effects over seemingly intact from its original release, and for the most part, they hold up pretty well. The music is, as always, excellent, featuring a strong orchestral score that really compliments the experience, though in retrospect, while the main theme of the game is excellent as a piece of score, it’s used a bit too much across the game and loses its impact somewhat as a result. The voice acting is still very strong, both in the newly added logs that appear in the game and in the original voice work, though Steve Downes, the voice of our protagonist, sounds less confident than he would in later games in the role, and some of the grunt voice work is a little too stereotypical and repetitive at times. The weapon effects still sound strong and compliment the experience well, and the enemy noises and ambient effects are also well implemented and assembled overall. If you’ve played a first person shooter any time in the past decade or so, you likely have a good understanding of how to play Halo, though you’ll need to spend a little bit of time learning some of the mechanics. By default, the left stick moves around while the right stick looks around, the A button allows you to jump, the X button reloads your weapon and picks up weapons, the Y swaps between your two held weapons, and the B swaps grenade types. The right trigger shoots your equipped weapon, the left trigger tosses grenades, the right bumper uses melee attacks, the left bumper turns on your flashlight, pressing in the right stick allows you to zoom in when applicable, and pressing in the left stick allows you to crouch. While you can adjust the controls as needed to suit your style of play, the default controls are easy enough to adjust to, if a little abnormal in retrospect. You’ll also have the opportunity to drive around a couple of vehicles as you play, and the game is nice enough to explain how the controls on those work, though for the most part the controls map to their default counterparts, meaning that driving a tank or Warthog jeep works with the left stick, for example. For the most part, Halo is simple to play even if you’re not a genre fan, and the game helpfully points out how its mechanics work as you play through it, so you’ll learn what you need to know when you need to know it, and won’t likely feel like you’re confused about how to play at any point. As Halo is a remake of the first game, the campaign retains the mechanics of the original and does not implement any of the additions or changes found in subsequent games, so fans of the franchise will notice that things are missing when they come into the game, though that is, in a sense, a part of the charm. However, many of the concepts across all of the games were born here, and as such, a lot of the elements will be immediately obvious. 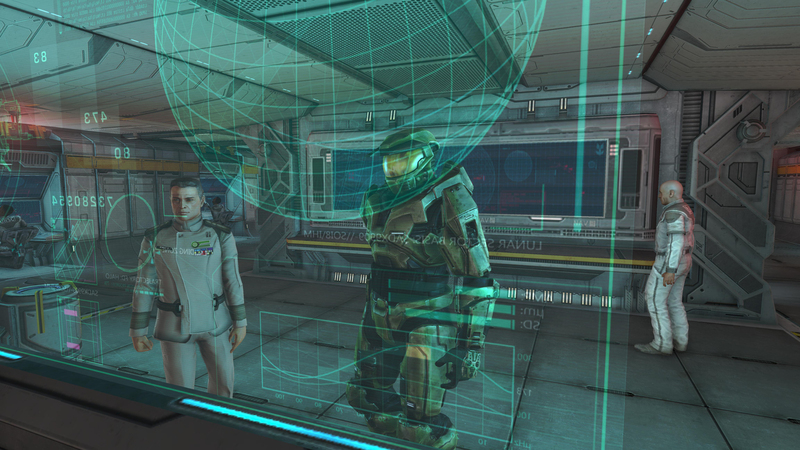 One of the biggest things Halo brought to the table was the concept of regenerating shields. Basically, as Master Chief takes damage, this will deplete his shields until they are empty, at which point it will then begin affecting his health. If his health depletes, he dies, but if you can avoid taking damage for several seconds his shields will begin to regenerate over time, allowing you to get back into battle in good shape after several seconds. You can also find health and shield powerups that will refill a damaged health bar or overcharge your shields to allow you to take extra damage before you need to worry about recharging. Halo also brought the idea of only being able to carry two weapons into the franchise, as Master Chief, being a human, only has so much space where he can logically carry weapons. You can swap your held weapon with any weapon you find on the ground by holding X, allowing you to switch up weapons on the fly, either with human or Covenant weaponry. 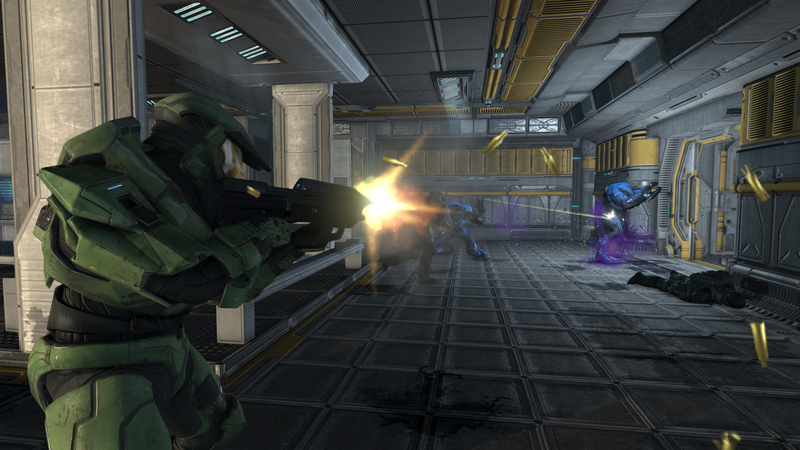 Human weapons, such as assault rifles, pistols, shotguns, sniper rifles and rocket launchers, use ballistic rounds and require reloading more frequently, while Covenant weapons, such as plasma pistols and rifles, cannot be reloaded but can overheat if fired too long, though the Covenant Needler is an exception to that rule and works more like a ballistic pistol with explosive rounds. Either way, you can swap out weapons as the situation dictates if you’re low on ammo or find something you’d rather be using, depending on the circumstances. 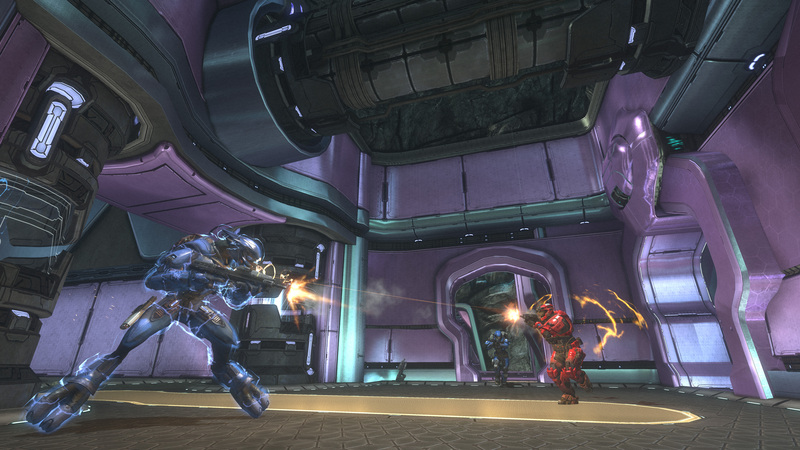 Master Chief can also use human fragmentation grenades or Covenant plasma grenades, which have their positives and negatives, though the plasma grenade ability that allows it to stick to enemies is often more amusing (if nothing else) and ends up making it a more useful option when applicable. Halo: Combat Evolved Anniversary does bring a couple new things to the table for those who have already played the game, mind you. For one thing, it brings in the Skulls from prior games, which are hidden items that, when found during the campaign, allow the player to modify the experience. These modifiers can either make the game easier or harder, depending on the Skull used, and they’re fairly challenging to find for players who enjoy the collection aspect of games. 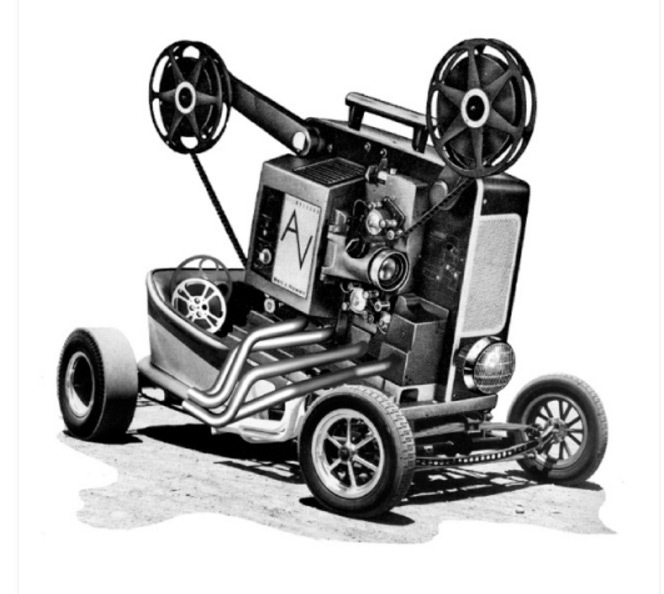 Terminals have also been added into the game that unlock various videos for viewing at the time and from the main menu. These videos add in some flavor to the plot for those who enjoy the storyline of the franchise, and they also come with codes at the end of each video that can be put into the Halo Waypoint app (and possibly on the website, though I’m unable to find the location at this time, as it’s been changed), to give the player added bonus credits in online play. 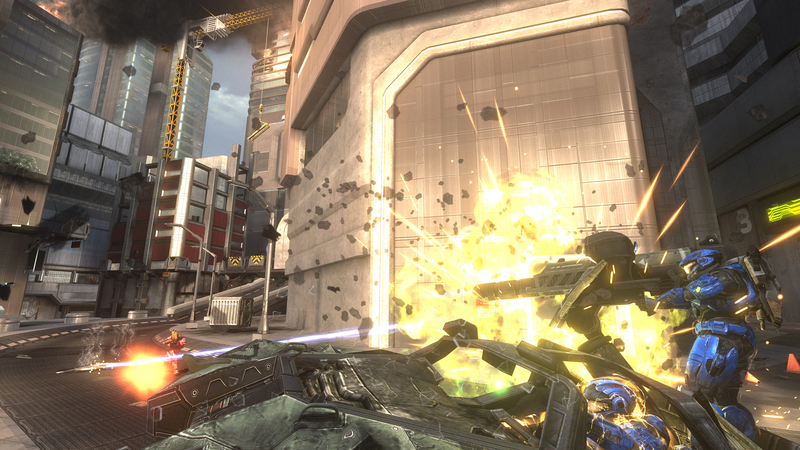 The game also comes with a functional online component, allowing players to play cooperatively with their friends through the campaign, or competitively through the Halo Reach Anniversary online system, which works with the online mode of Halo: Reach while adding in maps from the multiplayer of Halo and Halo 2. As in Halo: Reach, you can upgrade your character with different armor modifications, grab screenshots and videos of play and so on. There are several main play modes available for you to work with, such as Assault (grab and arm a bomb in the enemy base to win), Capture the Flag, Headhunter (pick up drops from dead enemies to score), King of the Hill, Oddball (hold the skull to score), Slayer (basically Team Deathmatch), Firefight (Horde Mode, more or less) and more, and the main play modes feature various modifiers for rules changes and team modifications as you feel appropriate. You can plow through the campaign, alone or with a friend, in about six to eight hours, depending on how much time you spend exploring for hidden items and such. The campaign doesn’t hold your hand nearly as much as more modern games, as well, so you’ll find that you may have to hunt a bit for your next objective depending on the situation. There are multiple difficulties to play through, however, including the infamous Legendary difficulty the series is known for, so with the campaign alone you’ve got plenty of options to keep you busy. Additionally, the multiplayer component adds in some solid replay options, as there are new/old maps to play around with that you may not have seen if you’re only recently a player of the franchise, and the Halo: Reach systems work as well here as they did in that game. 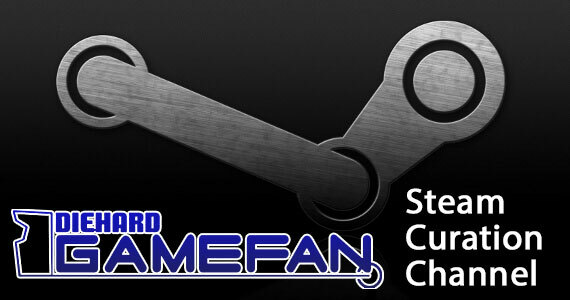 The game also has some collectibles to find, with the Terminals and Skulls you can look for, and there are also a whole lot of Achievements to earn, and none of the Achievements are tied into the multiplayer mode so those who prefer not to deal with online play for their Achievement hunting will find this to be up their alley, though there are Achievements for the online; they’re just tied to Halo: Reach instead. You can also dump the multiplayer maps directly into Halo: Reach and play online with that, should you have it, and as the Anniversary Map Pack is a fifteen dollar download on its own, really, you’re getting the maps with a remake of Halo for only twenty five dollars more, which isn’t a bad deal. From a content perspective, Halo: Combat Evolved Anniversary offers a good amount of options to fool around with, and with its lower than normal price tag, it justifies its asking price on the content front alone. The single biggest issue with Halo as a game is that it’s honestly somewhat antiquated, mechanically, and while it’s still fun to play, it doesn’t hold up as well as it could in comparison to its successors and other entries in the genre. The game is literally a new coat of paint over an old house, and while it’s certainly very pretty, it’s missing a lot. The game features, in the campaign, a sum total of eight standard combat weapons, something the sequel nearly doubled, and unlike its sequels, you’ll find that there are no equipment or dual wield options here for you to work with, which both highlights how far the series has come in a decade and also highlights that this is a limited experience upon reflection. This is not to say that Halo on its own doesn’t hold up; it’s still fine and mechanically enjoyable, but it’s a bare product in comparison to its successors. Further, while the multiplayer maps are solid, the campaign map layout in Halo can be a bit confusing at times, and while the lack of the game holding your hand and pointing you onto the next objective is fine from a challenge perspective, but annoying when you eventually get lost moving around the occasionally repetitive hallways. Finally, while the multiplayer component is cute if you don’t already own Halo: Reach, the maps are the same maps included in the Anniversary Pack DLC, so if you want the extra maps you could just download those, and if you don’t have Halo: Reach you’re only going to be able to do so much unless you drop the cash for that, making this less of a stand-alone product than it could have been. Honestly, Halo: Combat Evolved Anniversary is a worthwhile release in the sense that it shows that the game still holds up solidly a decade later while also showing how far the franchise has come, and while it’s not without flaws, for the price it’s not a bad investment all in all. The plot still holds up reasonably well after all this time, the remade visuals look clean and impressive in action, both on their own and in comparison to the original visuals, and the audio is very solid for the most part. 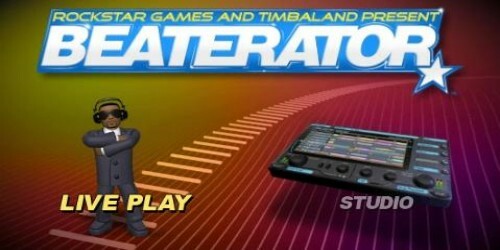 The game is pretty easy to play and offers useful tutorials that give you a good idea of how to work with the mechanics, and while the game lacks a lot of the changes and features of its successors, on a base mechanical level it’s still very strong, and offers plenty of extra content to keep the game interesting even after completing it. The game shows its age a bit because it lacks a lot of the innovations that have come along since its release, leaving it feeling a bit limited as a result, the campaign map layout is difficult to work with at times, and the multiplayer component feels like a piece of the multiplayer in Halo: Reach, leaving it feeling limited unless you have that game as well. As a historical piece, Halo: Combat Evolved Anniversary is an excellent look back at where the franchise all began and a good reflection on where it’s gone, and it’s still a solid game with a lot to offer, but it’s at its best when considered in those regards, because it lacks a bit when taken purely on its own merits. Halo: Combat Evolved Anniversary is a strong remake of its predecessor and shows that the game holds up well enough a decade after the fact, but while it’s still a solid game and there’s a good amount of content to it, it still shows its age and limitations on consideration. The plot still manages to carry the experience without much trouble at all, the remastered visuals look fantastic in comparison to the originals and hold up well on their own, and the audio is generally as strong as it ever was. The game is easy to jump into, and while the control scheme is a little odd in its default setting, the mechanics themselves are easy to learn and understand and the game makes a good effort to educate the player on how it works. The game is a bit more simplistic than more recent entries in the series and lacks some of the innovations they introduced, but still holds up well from a mechanical standpoint, and there’s a good amount of content to the game that will keep fans coming back long after they’ve completed the campaign. 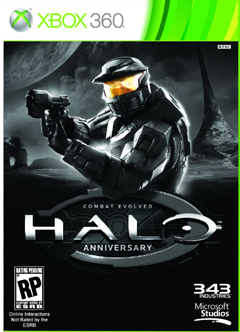 Sadly, because it’s a remake of an older title that leaves the framework of that game intact, the game feels limited in comparison to more recent games in the series, and beyond that, the campaign map layout leaves a bit to be desired and can be confusing, and the multiplayer elements are meant to be added into those of Halo: Reach and don’t hold up as well on their own. Halo: Combat Evolved Anniversary is an excellent product that gives some great perspective on where the franchise came from and how far it’s come, and it’s an excellent nostalgia piece that’s good for remembering the game or finding out about it for the first time, but taken on its own merits it tends to show its age in unfortunate ways.